A new tourism destination for culture tourism Istar-Pontica (Danube – the Black sea) will popularize culture sites along the Danube river. The region offers a unique combination of culture layers with interesting and attractive sites. This is a mystical combination of the eternal river in the enigmatic sea, keeping the legends of the Noa's ark, for the fairy amazons, mermaids and wood-nymphs, legendary heroes and Gods. 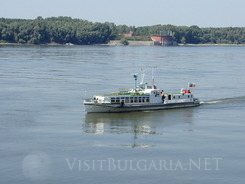 The destination includes six regions on the birder between Bulgaria and Romania – Dobrich, Silistra, Rousse and Constantsa, Calarasi and Gurgevo in Romania. The tourism sites included in the new trans border destination are various – museums, galleries, aquariums, sea tokens, architecture chefs d'oeuvre, monasteries, Nature reserves, 199 culture sites, representing the common features of the region. Findings from the mound nearby the Shabla village Dourankulak and Varna Necropolis talk about a thriving European civilization from 5th century B.C. A luxurious map of 200 culture sites in the region was developed during the working project. The Rocky monasteries and churches are of great interest for tourists. The cross border region offers over 100 churches and over 200 remains from religious temples. The destination offers an unique collections of authentic old icons, part of museum collections in Constantsa, Rousse, Dobrich, Calarasi, Silistra, Toutrakan and Balchik. Some of the icons are believed to posses a miraculous power. Some of the Christian churches in the region are also beloved to offer miraculous relics. The region is also characterized with a huge ethnographic diversity. The historians remind, that this part of the river has been the entrance door for the Great migration of the people with constant invasions. With a special care for the nature, the project also includes “Our Green Zone” section, applied to the map. The section reminds of the unique natural sites along the delta of the Danube river, the Dourankulak lagoon and the migration corridor Via Pontica, extremely interesting for ornithologists.